Writing a review is the best way to support your yoga teachers or studios. It's also a great contribution to the yoga community and will help lots of yogis around the world find the right yoga experience. start by filling out the overall start rating by clicking the stars (you'll see then fill up). 3. Once you're done, you'll need to click sign up and submit. This will create you a yogi profile on YogaTrail, which you'll then be invited to complete. If you already have an account, simply click Log in instead. 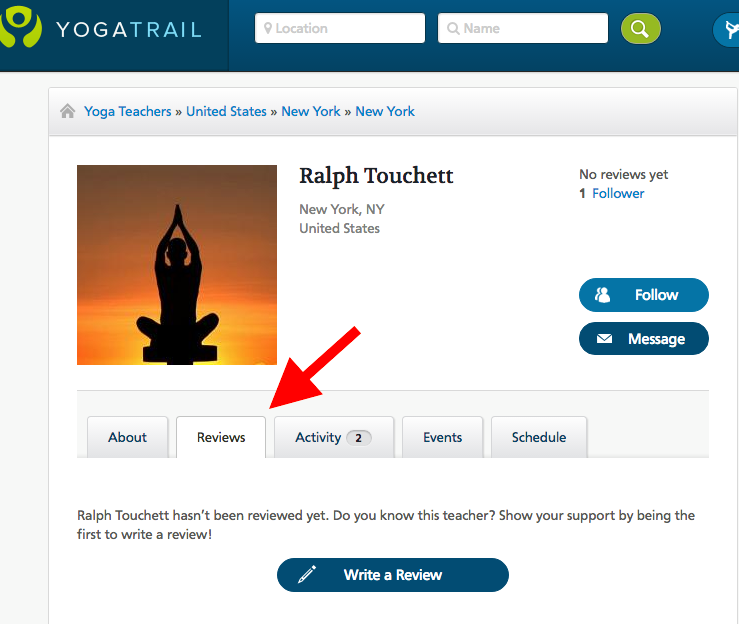 People must sign up before they can post a review to protect all the businesses listed on YogaTrail from spam and potentially abusive reviews. Otherwise, there's no way of knowing who's reviewed who, or to prevent people from reviewing the same person or place several times. Accountability is important when somebody's business and livelihood is on the line. Changing your review: in the interest of fairness, people cannot review a place more than once. But if you're not 100% happy with your review, you can simply leave a new review for the same profile. The new review will overwrite your previous one. After reviewing, you'll also help your teacher or studio (a lot) by sharing your review on social media. And if your teachers or studios aren't on YogaTrail yet, invite them here!